The Xperia pro uses the traditional droid Gallery, which hasn’t really seen much change in Gingerbread. It has good functionality, cool 3D looks and nice transition effects, but unfortunately only shows a downsized version of your images. You should have noticed the 3D switch by now at the top. It opens a different gallery section that stores only your 3D panorama shots. The standard camera photos and panoramas are in the familiar camera folder in the gallery. To view the 3D panoramas, you need to connect your phone to a compatible 3DTV. We tried them on the LG Optimus 3D, but the device couldn’t recognize them. Sony Ericsson has added support for Facebook albums too. They are distinguished by the small Facebook logo on them and when viewing individual pics from that album, you can "like" them with the thumbs up button in the upper right corner. Photos can be sorted by date with the help of a button in the top right corner, which switches between grid and timeline view. The gallery supports finger scrolling or panning so you can skip images without having to return to the default view. Thanks to the Xperia ray's multi-touch support pinch zooming is also available here but you can also double tap or use the +/- buttons. Images can be cropped or rotated directly in the gallery. Quick sharing via Picasa, Email apps, Facebook, Bluetooth or MMS also comes in handy. The BRAVIA engine enhances contrast and colors, as it sharpens the image and reduces noise. These steps would normally lead to artifacts, but the high-density screen of the Xperia ray makes them invisible. You can switch BRAVIA off, but we recommend you keep it on - it really improves the image quality. There is no dedicated video player app on the Xperia pro as in most of the droids out there. Fair enough, maybe a fancy UI for picking a video is not that important, playing videos is what really counts. Well, that’s another disappointment – the video player supports only 3GP and MP4 videos. To its credit, the Xperia pro did play a 720p MP4 video (but not 1080p). And the 3.7” FWVGA Reality screen offers excellent image quality (the BRAVIA engine comes into play here too) and spot-on aspect ratio. If you re-encode your videos before hand, the Xperia pro can make a good PMP. Or you could just download a capable video player off the Android Market and make your life easier. This would address other deficiencies of the Xperia pro video player, like lack of subtitles. The music player on the Xperia pro is the same app you get in the Xperia ray, the Xperia arc S. The interface is laid out in four tabs for the available sorting options: all artists, all tracks, playlists and albums. If you hit the menu key you’ll get a search shortcut, as well as send and delete options. The Now Playing screen offers nothing but the standard music controls, shortcuts to the library and the Infinite key. The latter lets you quickly look up a song on YouTube or browse for the lyrics. The music fans will appreciate the rich selection of equalizer presets. You also get Silent mode, which mutes all other sounds except for alarms - great for uninterrupted listening. Much like the Gallery, the Music player on the Xperia pro lets you "like" tracks you're listening to, which posts it on your wall. Later on, you can discuss them with your friends through the Friends' music and videos app (sometimes called Media discovery). There's a widget too, so you can always be up to date with what you're friends are listening to. 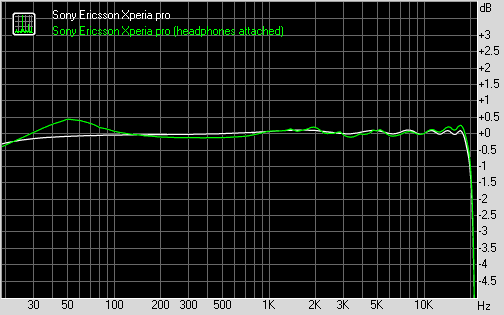 The Sony Ericsson Xperia pro did reasonably well in our traditional audio output test. It got some good scores here and there and was reasonably loud so most users won't have much to frown at. As usual the really impressive scores are achieved with the smartphone connected to an active external amplifier. 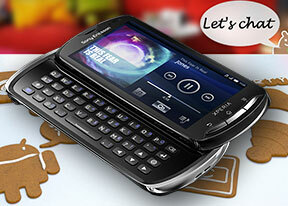 In that case the Sony Ericsson Xperia pro hasn't got a single weak point to its performance. Unfortunately, when you plug in a pair of headphones the stereo crosstalk rises beyond what we consider good, there's some distortion to be noticed and the frequency response deviates a little (though, that one remains pretty good). The noise level and dynamic range remain unaffected, but the overall performance in the second part of the test was pretty mediocre. The Sony Ericsson Xperia pro is also equipped with an FM radio, which has a really neat and simple interface. It automatically scans the area for the available stations and places “notches” on the frequency dial for easier scrolling to the next station. Or you can mark some of them as favorite. The TrackID service is also available and works within the radio app.